Samsung Galaxy S4 is the latest generation flagship device of Galaxy series. Galaxy series of Samsung has been a major success in mobile market and they have captured most of the share too. In fact Galaxy series devices are the only one who is able to give direct competition to the sales of Apple iPhone series. Lets have a look at specs of Samsung Galaxy S4 runs on Snapdragon 600/ Exynos 5 Octa Core CPU variants. It comes with 2GB of RAM with internal storage options of 16/32/64 GB. You can expand the storage via micro SD card slot. Phone comes with 13 Mega Pixel Full HD camera at rear which is capable to shoot at 120 FPS. Phone has a Super AmoLED Full HD screen of 4.9 inches. It’s been while that Samsung Galaxy S4 is released in market and many of you want to root your device so that you will be able to play with its Octa Core CPU and even install Custom ROMS if you are not a fan of TouchWiz UI. Below we have made a simple and easy guide for you of all have a look at that. As we all know that Samsung Galaxy S4 is available in two variants such as international version comes with Exynos Octa Core CPU and some regions have Snapdragon 600 Quad Core CPU. This guide is for Galaxy S4 with Exynos Octa Core CPU. You will need following things to root your Device. Odin. Download it from here. USB Drivers. Download it from here. CWM Recovery. Download it from here. If you have Samsung Kies installed in your system then you need not to download USB drivers. Now Run Odin from in system and make sure Kies is not running at that time. You can disable it by using Task Manager. When Odin opens press on PDA option and navigate to tar.m5 file which you got after extracting the zip file CWM Recovery. Make sure you have Auto Reboot and F Reset time ticked. Now you need to turn your device off and turn it into downloading mode for that make the use of Volume Down + Power Button + Home Button combination. If you succeed then you will see a warning screen. To go further click on Volume up button but if you want to cancel the process tap volume down. After pressing Volume up button connect you Galaxy S4 to Computer via USB cable. Now wait for Odin to recognize it. After that Press on Start button and wait for process to complete. As the process completes your device will restart automatically. Turn your device off again. Now use Volume up + home + power button combination to enter into recovery mode. Now with the help of volume buttons navigate to root your device option and tap on power button to select it. After the process phone will you will have to reboot your device and you can do that by navigating to reboot the device option. Congrats you have now rooted your Galaxy S4 successfully. Now you can install apps which need root and even install ROMS on your device. Were you able to root your device? Tell us in comments below. 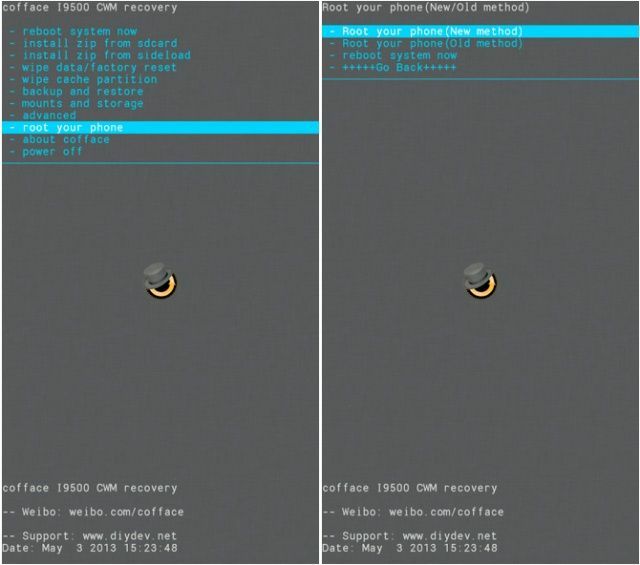 Rooting samsung S4 is really easy, after following this tutorial i’m able to do in correct way. Odin has made rooting of any Samsung Droid really easy.